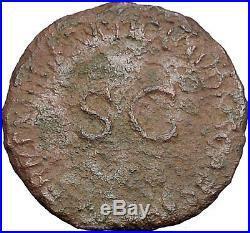 Item: i49179 Authentic Ancient Coin of. 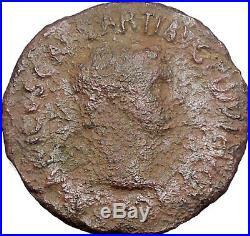 Germanicus Julius Caesar Bronze As 29mm (10.63 grams) Rome mint: 37-38 A. Under Claudius Reference: RIC I 106 (Claudius); BMCRE 218 GERMANICVS CAESAR TI AVG N – Bare head of Germanicus right. TI CLAVDIVS CAESAR AVG GERMANI IMP P P around large SC. An interesting theory recently advanced holds that this coin was struck by Claudius to replace a similar issue made by Caligula, which was being withdrawn from circulation due to the “Damnatio” passed by the Senate against Caligula’s memory. Coins which depicted Caligula were to be recalled and melted down, or otherwise defaced. Germanicus, however, was still widely admired, and he was Claudius’ brother in addition to being Caligula’s father. To differentiate Claudius’ issue from that of his hated predecessor, Germanicus is depicted head right instead of head left. Germanicus Julius Caesar 24 May 16 B. 19, commonly known as Germanicus , was a member of the Julio-Claudian dynasty and a prominent general of the early Roman Empire. He was born in Lugdunum , Gaul , and was named either Nero Claudius Drusus after his father or Tiberius Claudius Nero after his uncle. He received the agnomen Germanicus in 9 BC, when it was posthumously awarded to his father in honour of his victories in Germania. Germanicus was the grandson-in-law and great-nephew of the Emperor Augustus , nephew and adoptive son of the Emperor Tiberius , father of the Emperor Caligula , brother of the Emperor Claudius , and the maternal grandfather of the Emperor Nero. Family and early life. Germanicus was raised and educated in Rome. His parents were the general Nero Claudius Drusus (son of Empress Livia Drusilla, third wife of Emperor Augustus) and Antonia Minor (the younger daughter of the triumvir Mark Antony and Octavia Minor , sister of Augustus). Livilla was his sister and the future Emperor Claudius was his younger brother. Germanicus married his maternal second cousin Agrippina the Elder , a granddaughter of Augustus, between 5 and 1 BC. The couple had nine children. Two died very young; another, Gaius Julius Caesar, died in early childhood. The remaining six were: Nero Caesar , Drusus Caesar , the Emperor Caligula , the Empress Agrippina the Younger , Julia Drusilla , and Julia Livilla. Through Agrippina the Younger, Germanicus was the Emperor Nero’s maternal grandfather. Germanicus became immensely popular among the citizens of Rome , who enthusiastically celebrated his military victories. He was also a favourite with Augustus , his great-uncle, who for some time considered him heir to the Empire. In AD 4, persuaded by Livia , his wife, Augustus decided in favour of Tiberius , his stepson from Livia’s first marriage to Tiberius Nero. However, Augustus compelled Tiberius to adopt Germanicus as a son and to name him as his heir see Tacitus , Annals IV. Upon this adoption, Germanicus’s name was changed to Germanicus Julius Caesar. He also became the adoptive brother of Tiberius’s natural son Drusus the Younger. Germanicus held several military commands, leading the army in the campaigns in Pannonia and Dalmatia. He is recorded to have been an excellent soldier and an inspired leader, loved by the legions. In the year 12 he was appointed consul after five mandates as quaestor. The death of Germanicus , by Nicholas Poussin , laments the passing of Rome’s last Republican. After the death of Augustus in 14, the Senate appointed Germanicus commander of the forces in Germania. A short time after, the legions rioted on the news that their recruitments would not be marked back down to 16 years from the now standard 20. Refusing to accept this, the rebel soldiers cried for Germanicus as emperor. Germanicus put down this rebellion himself, to honour Augustus’ choice and stamp out the mutiny, preferring to continue only as a general. During each of the next two years, he led his 8-legion army into Germany against the coalition of tribes led by Arminius , which had successfully overthrown Roman rule in a rebellion in 9. His major success was the capture of Arminius’ wife Thusnelda in May 15. He let Arminius’ wife sleep in his quarters during the whole of the time she was a prisoner. He said, “They are women and they must be respected, for they will be citizens of Rome soon”. He was able to devastate large areas and eliminate any form of active resistance, but the majority of the Germans fled at the sight of the Roman army into remote forests. The raids were considered a success since the major goal of destroying any rebel alliance networks was completed. After visiting the site of the disastrous Battle of the Teutoburg Forest , where 20,000 Romans had been killed in 9 CE, and burying their remains, he launched a massive assault on the heartland of Arminius’ tribe, the Cheruscans. Arminius initially lured Germanicus’ cavalry into a trap and inflicted minor casualties, until successful fighting by the Roman infantry caused the Germans to break and flee into the forest. This victory, combined with the fact that winter was fast approaching, meant Germanicus’s next step was to lead his army back to its winter quarters on the Rhine. In spite of doubts on the part of his uncle, Emperor Tiberius, Germanicus managed to raise another huge army and invaded Germany again the next year, in 16. He forced a crossing of the Weser near modern Minden , suffering heavy losses, and then met Arminius’ army at Idistoviso, further up the Weser, near modern Rinteln , in an engagement often called the Battle of the Weser River. Germanicus’s leadership and command qualities were shown in full at the battle as his superior tactics and better trained and equipped legions inflicted huge casualties on the German army with only minor losses. One final battle was fought at the Angivarian Wall west of modern Hanover , repeating the pattern of high German fatalities forcing them to flee. With his main objectives reached and with winter approaching Germanicus ordered his army back to their winter camps, with the fleet occasioning some damage by a storm in the North Sea. Although only a small number of soldiers died it was still a bad ending for a brilliantly fought campaign. After a few more raids across the Rhine, which resulted in the recovery of two of the three legion’s eagles lost in 9, Germanicus was recalled to Rome and informed by Tiberius that he would be given a triumph and reassigned to a different command. Despite the successes enjoyed by his troops, Germanicus’ German campaign was in reaction to the mutinous intentions of his troops, and lacked any strategic value. In addition he engaged the very German leader (Arminius) who had destroyed three Roman legions in 9, and exposed his troops to the remains of those dead Romans. Furthermore, in leading his troops across the Rhine, without recourse to Tiberius, he contradicted the advice of Augustus to keep that river as the boundary of the empire, and opened himself to doubts about his motives in such independent action. These errors in strategic and political judgement gave Tiberius reason enough to recall his nephew. Command in Asia and death. Germanicus was then sent to Asia , where in 18 he defeated the kingdoms of Cappadocia and Commagene , turning them into Roman provinces. During a sightseeing trip to Egypt (not a regular province, but the personal property of the Emperor) he seems to have unwittingly usurped several imperial prerogatives. The following year he found that the governor of Syria , Gnaeus Calpurnius Piso , had canceled the provincial arrangements that he had made. Germanicus in turn ordered Piso’s recall to Rome, although this action was probably beyond his authority. In the midst of this feud Germanicus died suddenly in Antioch. His death aroused much speculation, with several sources blaming Piso, under orders from Emperor Tiberius. This was never proven, and Piso later died while facing trial (ostensibly by suicide, but Tacitus supposes Tiberius may have had him murdered before he could implicate the emperor in Germanicus’ death), because he feared the people of Rome knew of the conspiracy against Germanicus, but Tiberius’ jealousy and fear of his nephew’s popularity and increasing power was the true motive. The death of Germanicus in what can only be described as dubious circumstances greatly affected Tiberius’ popularity in Rome, leading to the creation of a climate of fear in Rome itself. Also suspected of connivance in his death was Tiberius’ chief advisor, Sejanus , who would, in the 20s, turn the empire into a frightful tyranny. Germanicus death brought much public grief in Rome and throughout the Roman Empire. His death was announced in Rome during December of 19. There was public mourning during the festive days in December. The historians Tacitus and Suetonius record the funeral and posthumous honors of Germanicus. At his funeral, there were no procession statues of Germanicus. There were abundant eulogies and reminders of his fine character. His posthumous honors included his name was placed into the following: the Carmen Saliare ; the Curule chairs ; placed as an honorary seat of the Brotherhood of Augustus and his coffin was crowned by oak-wreaths. Other honors include his ivory statue as head of procession of the Circus Games; his posts of priest of Augustus and Augur were to be filled by members of the imperial family; knights of Rome gave his name to a block of seats to a theatre in Rome. Arches were raised to him throughout the Roman Empire in particularly, arches that recorded his deeds and death at Rome, Rhine River and Nur Mountains. In Antioch , where he was cremated had a sepulchre and funeral monument dedicated to him. On the day of Germanicus death his sister Livilla gave birth to twins. The second, named Germanicus, died young. In 37, when Germanicus only remaining son, Caligula , became emperor, he renamed September Germanicus in honor of his father. Many Romans considered him as their equivalent to King Alexander the Great. Germanicus grandson was Emperor Nero Caesar -died 68 AD-the last of the Julio-Claudian dynasty. Ilya Zlobin, world-renowned expert numismatist, enthusiast, author and dealer in authentic ancient Greek, ancient Roman, ancient Byzantine, world coins & more. Ilya Zlobin is an independent individual who has a passion for coin collecting, research and understanding the importance of the historical context and significance all coins and objects represent. Send me a message about this and I can update your invoice should you want this method. Getting your order to you, quickly and securely is a top priority and is taken seriously here. Great care is taken in packaging and mailing every item securely and quickly. What is a certificate of authenticity and what guarantees do you give that the item is authentic? You will be very happy with what you get with the COA; a professional presentation of the coin, with all of the relevant information and a picture of the coin you saw in the listing. Additionally, the coin is inside it’s own protective coin flip (holder), with a 2×2 inch description of the coin matching the individual number on the COA. Whether your goal is to collect or give the item as a gift, coins presented like this could be more prized and valued higher than items that were not given such care and attention to. Is there a number I can call you with questions about my order? When should I leave feedback? Please don’t leave any negative feedbacks, as it happens sometimes that people rush to leave feedback before letting sufficient time for their order to arrive. The matter of fact is that any issues can be resolved, as reputation is most important to me. My goal is to provide superior products and quality of service. How and where do I learn more about collecting ancient coins? Visit the “Guide on How to Use My Store” for on an overview about using my store, with additional information and links to all other parts of my store which may include educational information on topics you are looking for. You may also want to do a YouTube search for the term “ancient coin collecting” for educational videos on this topic. The item “Germanicus Julius Caesar 37AD Struck under Claudius Ancient Roman Coin i49179″ is in sale since Tuesday, November 29, 2016. This item is in the category “Coins & Paper Money\Coins\ Ancient\Roman\ Imperial (27 BC-476 AD)”. The seller is “highrating_lowprice” and is located in Rego Park, New York. This item can be shipped worldwide.